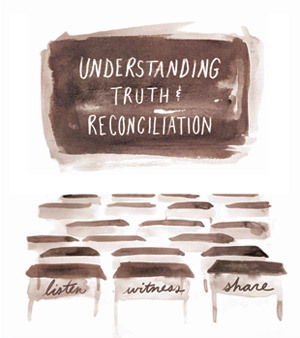 When: Wednesday, September 11, 2013, 9:45 a.m. to 3:30 p.m.
UBC's Okanagan campus is hosting a dialogue about truth and reconciliation for all students, staff and faculty today, in support of the final national Truth and Reconciliation Commission (TRC) event in Vancouver on September 22. The day features discussions on the 4 R's: residential schools, recognition, reconciliation and responsibilities. 12 noon to 12:50 p.m.
What is the Truth and Reconciliation Commission? Survivor testimonial and intergenerational testimonial are included. All activities take place in the Ballroom, (Room UNC 200) University Centre, 3272 University Way, UBC’s Okanagan campus, Kelowna. The event is open to the public. The Truth and Reconciliation Commission of Canada’s mandate is to learn the truth about what happened in residential schools and inform all Canadians. The Commission aims to guide and inspire First Nations, Inuit, Métis peoples and Canadians in a process of finding truth and healing leading toward reconciliation and renewed relationships based on mutual understanding and respect.